The unique opportunity to combine two outdoor activities: hiking and horseback riding. An itinerary where you will ride or hike every day in a new environment. Groups of 2 or 3 riders: + 250 € / pers. Tour and visits as described, hiking and horseback rides as described, full board from dinner of day 1 to breakfast of day 13 except 1 dinner, English speaking translator, Russian 4x4 with driver, a cook per group, nomadic equestrian guide, financial guarantee of your deposits. This adventure tour in Mongolia combines hiking and horseback riding! After 5 days hiking through the mountains of Khangai spend 4 days on horseback in the Orkhon Valley. Breakfast and drive to Khogno Khan Park. First short hike to the Ovgon Khiid Monastery and in the Elsentasarhaï sand dunes. Dinner and overnight in tents in the wilderness, with mattress and shower tent. After breakfast, drive to the Tsenkher Hot Springs. We enjoy a relaxing bath in the hot springs. Overnight in yurt camp (2-4 people per yurt in individual beds, shower and toilet in a separate building). These four days are spent hiking through the Khangai Mountains, that we will cross towards Southwest. From the hills surrounding Tsenkher we reach the peaks that dominate the Orkhon Valley to over 2400 m.
We discover Tovkhon Monastery, one of the most sacred places of Mongolia, nestled high in the mountains. We then descend through larch forests to the Orkhon Valley and its famous waterfalls. Every day we hike between 4 and 6 hours in a gentle mountain terrain. The nights are spent in tents in the wilderness, with mattress. Our 4x4 vehicle joins the group each night with camping equipment. On the evening of day 7, we drive to the yurt of a nomadic family. 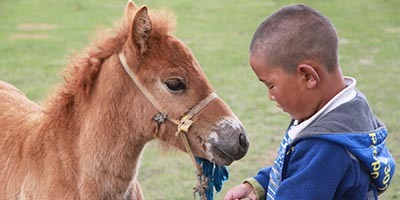 This is the opportunity to discover the unique lifestyle of Mongolian nomads. Night in a guest yurt close to the family yurt. These four days are spent trekking on horseback through the famous Orkhon Valley. Every day, we ride between 4 and 5 hours depending on the riding ability of the group, and therefore the pace of the ride (the slower you ride, the longer you stay in the saddle!). The vehicle meets us for the picnic lunch (nothing to carry on horseback), then in the evening to set up camp. The first three nights are spent in tents in the wilderness, with mattress and shower tent. The last evening, we arrive at Karakorum. Overnight in yurt camp in Karakorum (2-4 people per yurt, in single beds, shower and toilet in a separate building). Breakfast and visit of the Erdene Zuu Monastery. Departure to Ulan Bator where we arrive in the afternoon. This tour has been specially created for fit travellers, who usually hike and are novice riders. We advise to take a few horse riding lessons before leaving, in order to be able to control your horse and enjoy you ride during the tour. "A very successful tour for sporting travellers who want to experience their first gallops with the nomads." Explore the major sites of Central Mongolia and stay with a nomadic family. A horse is at your disposal. 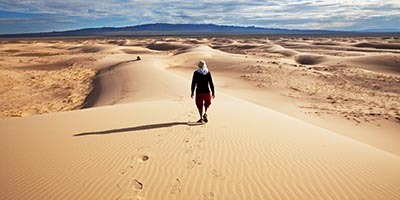 Hike in the dunes of Bayan Gobi Desert and in the steppe of Orkhon Valley, a World Heritage Site, for a contrasted trek!